Fashioning Now, changing the way we make and use clothes is an exhibition and symposium at University of Technology, Sydney 28 July – 28 August 2009. The exhibit features innovative research projects from Australian and International practitioners including three members of staff and research from LCF Prof Helen Storey MBE, Dr Kate Fletcher and Jennifer Shellard. Fashioning Now addresses all stages of the clothing lifecycle exploring the production and use of garments and addressing how and why they become discarded. The work has been submitted in an array of different mediums from garments,textile objects, time based art, photography and fashion illustration. The designers have used upcycling techniques, zero waste production, slow fashion, bespoke services, traditional craft and many more methods to present a series of sustainable solutions and poise scenarios for further research and development. 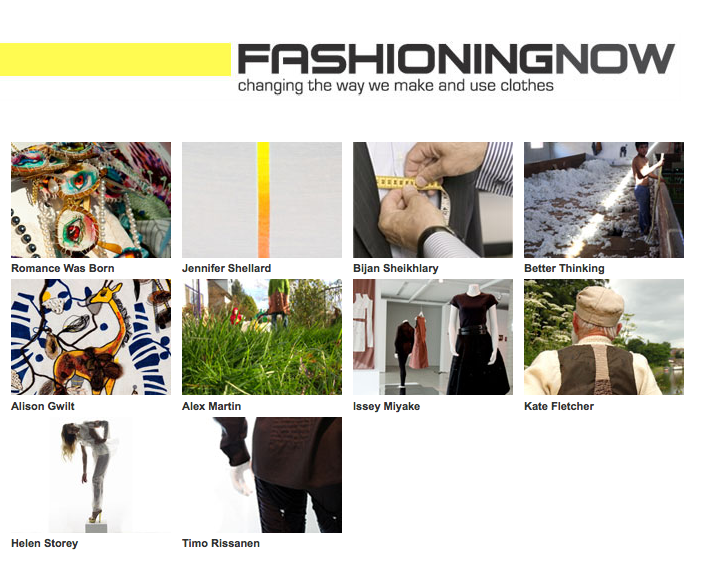 Visit the Fashioning Now website which hosts information about the event, the exhibitors and their work. 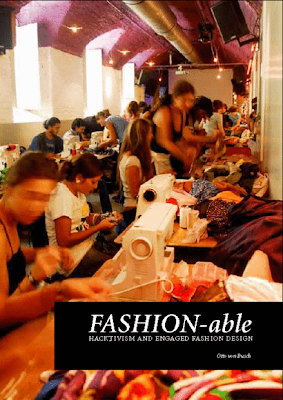 Case studies are available to download and the website will be updated regularly making is a valuable resource for those with in an interest in sustainable fashion and textiles. Trendy-workshop.com is co-founded by Tristan de Montebello, a french fashion platform designed to allow users to design their own clothing and share their designs with other users within the trendy workshop community forum. However, as the clothing is being produced China its makes me questions some elements of the supply chain? Mirror, Mirror on the Wall -What looks the prettiest of them all? Do you every spend hours deciding what to wear? I spend hours trying on clothing on only to discard it and try something else on, then something else, and something else etc… only to resolve the problem by wearing the original garment! I have been reviewing lots of digital technology for fashion – to catalogue clothing, multiple ways to mix and match garments my computer or iphone. All of these pieces of softwear allow me to think through “outfits” to create “looks”. But what about interactive technology? Digital tools that allow you to move around in front of your mirror and guide you through the “dressing up” process. I love shopping! I really do! I like to pick up pieces of clothing, try different garments on and really engage in the physical activity of trying things on. I love using digital technology to piece together garments but would never sacrifice the “real time” shopping experience in favour of using only digital technology. Therefore exploring new ways to design or programme both the tangible and intangible elements of the “fashion experience” into a system or service would really appeal to me. I have come across two modes of practice within the fashion industry. The first is the SCHMIDT RFID smart retail system adopted by fashion retailer mi-tu, in Hong Kong. I saw them present at a symposium in Boras, Sweden last year. They had the technology set up within an exhibition space allowing visitors to try out the technology. The way it works: all garments have RFID tags attached and there are sensors concealed within a “smart dressing mirror”. When a customer holds a garment in front of the mirror it detects the RFID tag and does all kinds of clever things. The interactive screen attached to the wall next to the mirror will display garments designed to match with your chosen piece supporting mix and matching. There is a virtual try-on simulator which can fit the garment onto the customers body shape. So the customer can try clothing on digitally! Customers are presented with a membership card that is also detected through RFID cataloguing past and present selections and adaptable to fit the customers style preferences. The RFID system also supports the staff within the store as they know where the customers are at all times and what they are doing. The second example is the smart dressing technology within the Prada epicentre store In NYC. Prada collaborated with IDEO (almost 5 years ago) to design interactive dressing rooms. They also used RFID technology to design an interactive dressing system. When the customer enters the dressing room and tries a garment on the magic dressing mirror will re-play a video from all angles in slow motion, allowing the customer to see themselves adorning the garment in greater detail. They also used RFID to present a narrative about each piece of clothing – allowing the customer to see different colour ways, fabrics and even original fashion sketches prior assembly of the garment. This presents a history of the garment allowing the customer to preview the concept through to the end out put. Both examples present exciting ways to use fashion using digital technology in real time and digital environments. Designing around customer interaction presents methods that have potential to engage users and enhance their “fashion experience” making it more memorable and meaningful. It think caution needs to be applied when using RFID systems. We live in a world where goods and services are advertised to us everywhere! Therefore the only downfall with RFID would be using this technology to try seduce consumers into buying goods and services (all of the time!!). Im thinking of the shopping scene in the movie “The Matrix” as an example – Tom Cruise walks into a shopping centre where eye scanning technology detects his character’s idenity – greeting him by name and trying to sell him something to accompany a previous purchase. Therefore I think considerate application can reach exciting outputs – but it needs to be applied in appropriate ways.